Should you decide to go see, rent or purchase Cloud Atlas, a film by the production team that brought us The Matrix trilogy and V for Vendetta, may I suggest you do so with this thought in mind –– this movie is intended to be more than just a piece of entertainment. It is far more than a mere movie. Directed by the trio of Lana and Andy Wachowski along with Tom Tykwer, these three visionary filmmakers clearly had much, much bigger ideas in mind than merely entertaining you for your hard earned money. This realization hit me about half way through the film, when suddenly it became as clear as a bell. What I realized was Cloud Atlas is a training film. Pure and simple. Yes, it is also meant to be two hours and forty-three minutes of cinematic thrills and excitement. However, just as The Matrix trilogy taught us the world we live in is completely illusionary and controlled by a sinister higher power. And V for Vendetta clearly demonstrated to us our current governments have become overtly fascist and dictatorial, Cloud Atlas has many, many important lessons to impart which are particularly valuable at this time in human history. 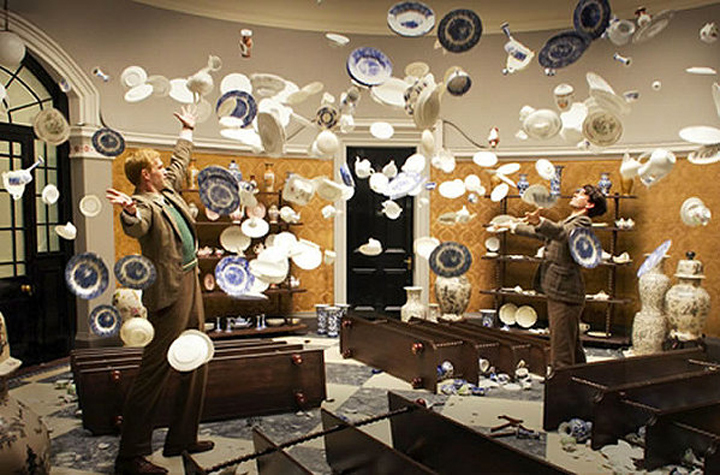 One look at the first extended trailer for the film obviously indicated Cloud Atlas was to be an incredibly ambitious undertaking. And indeed, after seeing it for the first time with its six simultaneous story lines, six different time lines and its multitude of characters all interacting in different lifetimes together, one can only imagine what a daunting challenge this film was to bring to the big screen. David Mitchell's 2004 science fiction novel required some major adaptation so movie audiences would be able to stay connected throughout. What I took away from this movie going experience were a whole series of very profound lessons. "Fear. Belief. Love –– phenomenon that determine the course of our lives. These forces begin long before we are born and continue after we perish." • The first lesson Cloud Atlas has to teach us is the lives we live, where we believe we are solitary, single-minded creatures are anything but. Rather, the film shows us in dramatic fashion we are connected to everyone around us and we have had multiple lives with many of the same souls. Thus, the whole concept of reincarnation and past lives becomes the overriding central theme running throughout the movie. If we understand we are intimately connected to everyone around us, again and again, lifetime after lifetime, then we can can begin to truly comprehend what the concept of oneness is all about. Where we realize we are all one in the same and we are tied to one another as soul brothers and sisters –– or soul families, if you will. By using the same actors to appear in a multitude of story lines and time frames, the film clearly demonstrates we seeing the same souls occupying different bodies. These souls interact together, over and over again, in different lifetimes and therefore, within the same soul groups. Thus we are being dramatically shown to be timeless beings who transcend death, who transcend our physical bodies and who transcend life on this Earthly plane. We are multi-dimensional souls who can never be killed and never die. Admittedly, there is so much going on within the Cloud Atlas narrative, you may need a scorecard to keep up with all the ongoing timelines, story lines and characters (see below). • Secondly, Cloud Atlas teaches us about the lessons of karma. Already a well established spiritual tradition throughout Asia, in the Western world karma is not well understood. It is not even a part of the western religions of Christianity or Judaism. Yet, karma is perhaps the major aspect of our life experiences on planet Earth. In fact, karma has become so overwhelming dominate in the human experience upon the Earth it has entrapped many, many souls on an endless cycle consisting of birth, life, death, reincarnation, repeated over and over again. In Buddhism, this process is known as the wheel of life, bhavacakra or Samsara. So here we have Cloud Atlas visually demonstrating the concept of karma through the medium of a big-budget Hollywood movie. You might think this kind of lesson would be better suited coming from a theologian, rabbi or priest, but sadly, in Western religions their messages have grown tiresome and frankly, outdated. Hence, the general public needs to be trained or upgraded in their understanding of how life really operates upon the 3-D Earth. "Yesterday my life was headed in one direction, today it is headed in another." • Thirdly, yet another vitally important aspect of the film centers around the concept of time. 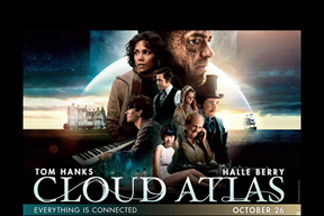 Cloud Atlas jumps back, forward and sideways from the years 1849, to 1936, to 1973, to 2012, to 2144 and to 2321 to tell its complex story lines. The film is edited and paced in such a way as it feels as if all of the story lines, and therefore timelines, are happening simultaneously. It's as if we are watching past, present and future events happen all at once. This is no accident. The filmmakers obviously intended to stretch our perceptions of time to such a degree where they all become blurred together as one. We have always believed time is linear, yet we must realize time is simultaneous. In other words, time must be seen as vertical, not horizontal. This is precisely why the story line has six different episodes all unfolding or occurring simultaneously. We are being trained to accept and then to process an entirely new understanding regarding the very nature of time itself. This is the reason why many of the actors –– Tom Hanks, Halle Berry, Hugh Grant, Hugo Weaving, Jim Broadbent, Jim Sturgess –– play as many as six separate characters each. Although these characters are all from different time periods, we see these actors's familiar faces through different lifetimes and sometimes even different gender roles. All of which is training us to understand how the process of reincarnation operates as it relates to time and the journey of the soul. On planet Earth we are so rooted to the flow of time we have become enslaved by it. Yet, in reality, time doesn't even exist and never did, except in our outmoded beliefs. Time is a totally and completely artificial construct which we have all bought into. When in fact, we are timeless, immortal beings having only temporary human experiences. Incidently, it is worth noting the significance of the number "6" and why it reoccurs throughout the film. In numerology, 6 symbolizes healing, love and teaching. And, coincidently, the only character in the movie who manages to live through two different story lines spanning from 1936 to 1973 is named –– Rufus Sixsmith! "The most important influence of the 6 is its loving and caring nature. Properly nicknamed the motherhood number, it is all about sacrificing, caring, healing, protecting and teaching others. No family or community can function without the power of the 6 to keep them together and safe. She is the glue that keeps a family or community together." - from Numerology.com. "We cross and recross our tracks like figure skaters." • Fourthly, Cloud Atlas displays an overpowering message in which love is seen eventually as the most important ingredient to life of all. Love is the glue which binds together the story lines of the movie, but more importantly, love is the common fabric of the entire Universe. Indeed, love will be the most integral element of the new world emerging for us right now. It is a world of a higher consciousness and thus of higher ideals. A world which is known as the Golden Age, or Heaven on Earth. Or the new Earth. Ultimately, all of these lessons combined make Cloud Atlas a must see movie and therefore I am giving it my highest recommendation. In fact, due to its complex and multi-dimensional story line, it may become necessary to watch this film a few times in order to get the most out of it. "Death. Life. Birth. Past. Present. Future." 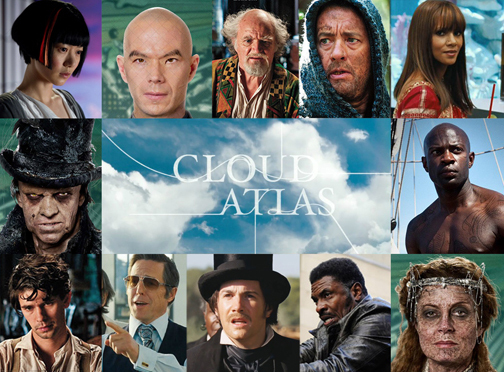 Cloud Atlas features a large and talented ensemble cast. Overall, the actors do a superb job of portraying a multitude of roles. Particularly impressive is the makeup for these wide array of characters which prevents one from figuring out when and where the actors have appeared in different roles and different story lines. You may not quite recognize all of the actors until the end credits role. Hugo Weaving is outstanding in a number of villainous characters he always seems to play in a Wachowski production, such as he did as the arch nemesis Mr. Smith in the Matrix trilogy. Halle Berry is also quite impressive in her long span of roles as a slave in 1849, to a Hispanic magazine reporter in the 1970's named Luisa Rey, to a futuristic woman in 2321 named Meronym, who comes from a distant planet to save the human race. Hugh Grant shows off his wide range by playing six different characters, one of whom is quite advanced in years. Again, the makeup is key which allows his performance to seem authentic. And finally, Tom Hanks does his usual fine work of portraying not one, but two heroic lead characters in Isaac Sachs in 1973 and Zachry in 2321. But you have likely never seen him play so many despicable roles at once which include –– a nasty English gangster, Dermot Hoggins, who throws a literary critic off a six-story building to his death and a shady 18th century doctor named Dr. Henry Goose, who attempts to poison one of his patients for his gold. Shocking. "Our lives and our choices... each encounter suggest a new potential direction." 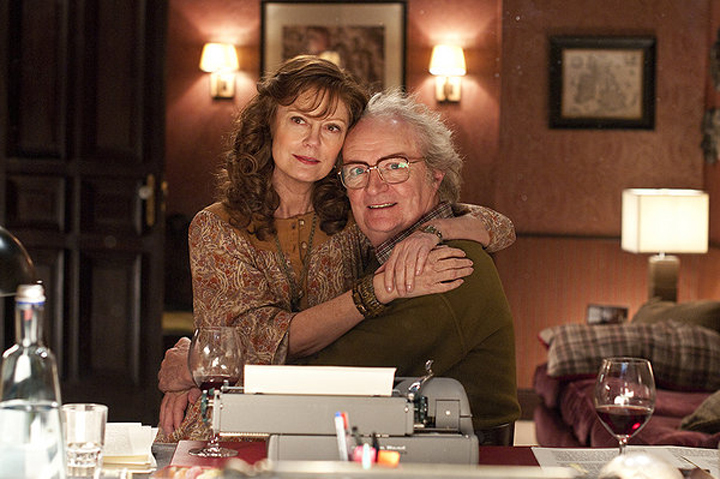 Cloud Atlas is not perfect. But then it is probably not supposed to be. The directing trio likely realized from the start they were going to really challenge the average audience member with their ambitious film. But it was worth the risk. This is not a new age, spiritual film per se. It is meant to be seen by a mainstream audience by instilling elements of drama, fantasy, science fiction and action adventure in its eclectic mix thereby appealing to a broad range of movie fans. There is a fair amount of gratuitous violence often found in the Wachowski's films which sometimes seems completely unnecessary. But what Cloud Atlas is not is boring. Never once. Despite its nearly three hour length, the film moves along with a rhythm and a flow which keeps you completely engaged in the plot lines from start to finish. That's quite an achievement in and of itself. "Yesterday, I believe would never have done what I did today. I feel like something important has happened to me." It is becoming more and more clear, Lana and Andy Wachowski do not belong to the typical Hollyweird den of tricksters, illusionists and muckrakers. Based on the films they have made since arriving in Hollywood in 1996, they appear to be dedicated, if not obsessed, with liberating humanity through art, film and spiritual education. In their approach to the art of filmmaking, Lana Wachowski has cited "the inexplicable nature of the universe [being] in constant dialogue with our own consciousness and our consciousness actually affect[ing] the inexplicable nature of the universe." Perhaps, we might even speculate the Wachowskis are part of some kind of alliance of artists who possess a strong desire to counteract much of the dark, mindless entertainment and programming emanating from most of the Hollywood dream factory. 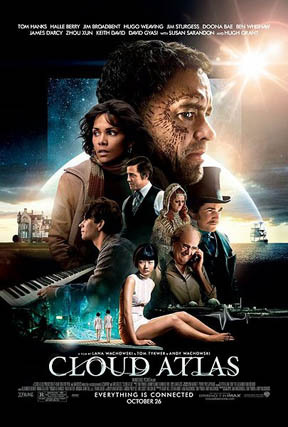 Even the story of bringing Cloud Atlas to the big screen is fascinating one. 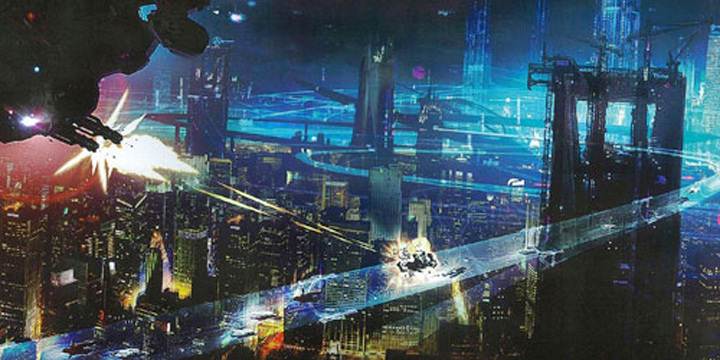 Apparently, the Wachowskis could not find a Hollywood studio interested in financing their ambitious project. The complex plot structure was always cited for the standard rejection they received. Eventually, they decided to invest their own funds but were finally able to secure sympathetic investors in of all places from Asia. This Asian connection is quite foretelling. Given the reports of an Asian alliance which has come together as a resistance to the New World Order, it should come as no surprise Asian backers were interested in bringing a story about reincarnation, past lives, the artificiality of time and the power of love to a mass audience. But of course. "I believe there is another world waiting for us –– a better world –– and I will be waiting for you there." When you watch Cloud Atlas, please keep in mind you are viewing vital lessons assisting you to more easily assimilate into a new world which is being birthed right now. This world is vastly different than the one we are leaving behind. It is becoming more and more obvious, many great people are emerging from the shadows who desire to make extremely profound and positive contributions to humanity's transition from an old paradigm to a brand new one as quickly and as smoothly as possible. The Wachowskis track record speaks volumes about their affiliation to the truth and the light. Movies are clearly becoming a big part of the learning lessons preparing us for a whole new world of higher ideals. 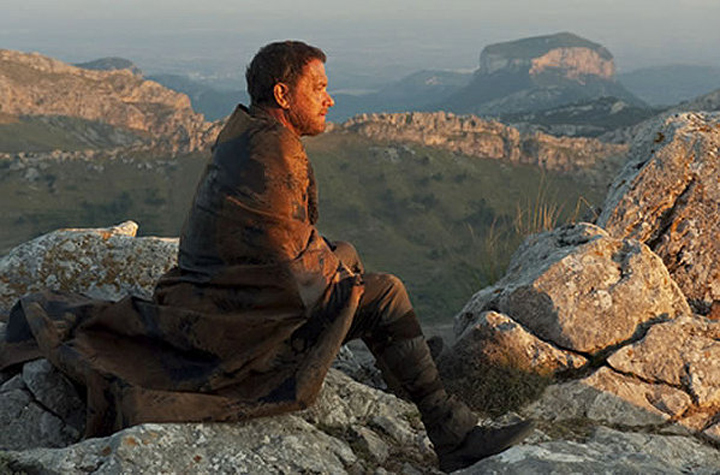 Cloud Atlas is one of those types of films like The Matrix and Avatar which are boldly offering the average movie fan a training ground for expanded consciousness, oneness and transformation. God bless the Wachowski's. God bless Cloud Atlas.